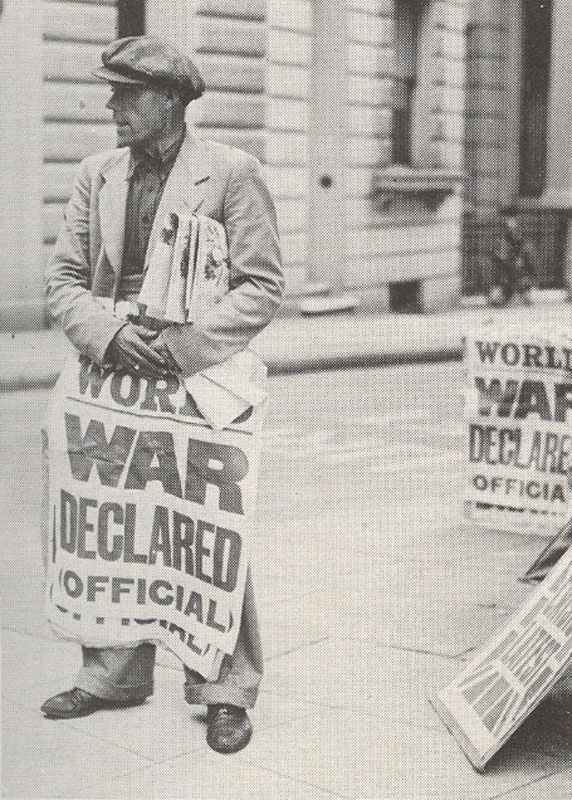 A London newspaper seller has the grim news of September 3, 1939. Panzers cross river Warta, south-west Poland. 1st and 4th Panzer divisions attacked repeatedly by Polish bombers in Radom-­Piotrkow area. Germans capture city of Czestochowa. The Polish Corridor cut in two. Germany rejects Anglo-French ultimatum of September 1. Final British and French Notes to Germany. Time limit set for agreement on withdrawal of German forces from Poland expires. BRITAIN AND FRANCE DECLARE WAR ON GERMANY at 11 a.m. and 5 p.m. respectively. WAR DECLARED BY AUSTRALIA, NEW ZEALAND AND BRITISH INDIA. Britain: P.M. Chamberlain broadcasts to nation at 11.15 a.m.: ‘You can imagine what a bitter blow it is to me that all my long struggle to win peace has failed.’ King George VI broadcasts to the people’s of the Empire. War Cabinet formed: Churchill appointed First Lord of the Admiralty. Ministry of Economic Warfare (blockade) established. First House of Commons sitting on a Sunday since 1820. First air-raid warning in London – but false alarm. Stukas sink Polish destroyer Wicher at Hela. Lone RAF Blenheim aircraft photographs German Fleet in Wilhelmshaven. First of series of propaganda leaflet raids on Germany (night September 3-4). British naval blockade of Germany announced. First wave of U-boats begin North Atlantic operations (27 merchant ships sunk until October 3). British liner SS Athenia torpedoed by German submarine U-30, northwest of Ireland; 112 passengers dead (inc. 28 Americans). Belgium: Government reaffirms her neutrality. King Leopold III assumes command of Belgium Army. August 25, 1939: UK and Poland Sign Mutual Defense Alliance…What a Joke!